Food pantries may not be something many people think of when considering economic development uses for vacant commercial spaces, but the should think again. When I tell people that food pantries can be a new and innovative way to help lift up communities, they look at me as if I’m a bit out of touch. I get it: Long the province of churches and charities, food pantries don’t hold the same kind of sway that housing or schools or businesses do when it comes to community development. They’re important, but often thought of as commonplace. A new model in New York is helping to change all of that. On Lenox Avenue and 141st Street, the West Harlem Community Healthy Food Hub is taking an economic development approach to helping low-income people eat better—one designed to build demand for fresh food as it builds partnerships among nonprofits, businesses, city agencies and investors. The hub is a food pantry with a farm-share program, offering produce and staples operating from what had been a long-vacant neighborhood storefront. It has transformed the space into a vibrant community center, with better health as its organizing principle. Gone are the traditional long lines of people handed a bag of canned goods and sent on their way. Here, residents “shop” for healthy food as part of a client-choice approach to food pantries that gives them more of a retail experience. They take part in cooking and nutrition classes, join the new walking club, or get help with public benefits, like the Supplemental Nutrition Assistance Program (SNAP)—what many people still refer to as food stamps. Because multiple services are offered in one place, residents are better able to take advantage of them, making it easier for them to eat healthier. 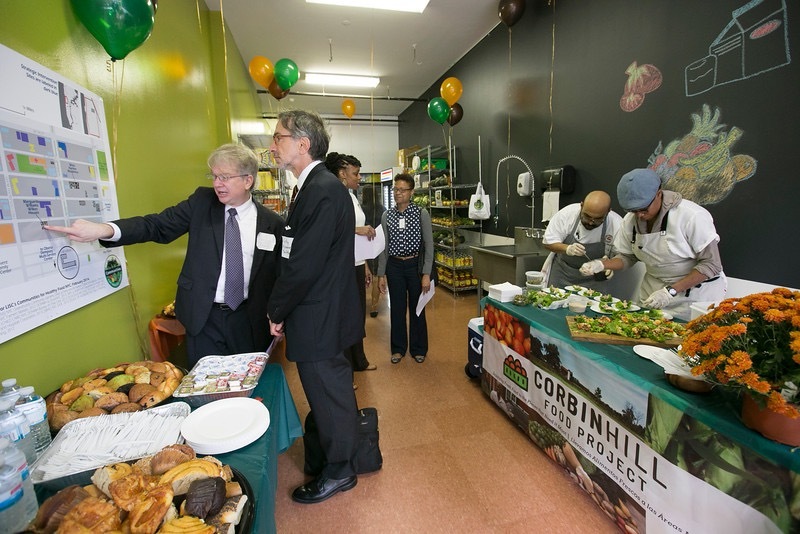 Celebrating its first anniversary recently, the hub grew out of a local planning process that is part of Communities for Healthy Food NYC program, a collaboration between the Local Initiatives Support Corporation (LISC) and the Laurie M. Tisch Illumination Fund. We partner with community development corporations (CDCs) that have deep roots in their neighborhoods to address how poverty and unemployment intersect with diet and disease—all in an effort to help people live better. In this case, we teamed up with West Harlem Group Assistance (WHGA), which like many CDCs is a significant nonprofit developer, owner and manager of real estate focused on raising standards of living in the surrounding community. WHGA had a vacant commercial space in its portfolio that, with a bit of planning and capital and a light retrofit, could be transformed into a bustling hub for food and community meet-ups. I think there are a couple of important takeaways from this process. First, we don’t need to reinvent the wheel to move forward. The Harlem hub is based on an even larger program in Brooklyn’s Bedford-Stuyvesant community, operated by the Northeast Brooklyn Housing Development Corporation. In that case, the two-story hub is also an employment engine, with a kitchen to train local residents in food-related jobs. It operates differently, on a larger scale, than its successor in Harlem. But we built off of what we learned in northeast Brooklyn to tailor a hub that works for residents in northwest Manhattan. This is also a different way to think about the work that we do to help people improve their health. CDCs typically oversee housing and commercial space while delivering related services to nearby residents. As such, we need to be asking which of those assets might be underutilized and how might we both leverage that space and experience as we reach out to new partners to help expand access to nutritious foods? It is increasingly clear that we need to think comprehensively about how food impacts the quality of our neighborhoods—just as we do with so many other aspects of local revitalization. When we feed programs that feed people, we can improve both health and economic outcomes that strengthen our communities.